Through this online publication we bring you one of the more than 1.000 BIDCE’s experiences from different issues such as citizenship participation, leisure, lifelong learning, community development, sustainable development, intergenerational relationship, etc. 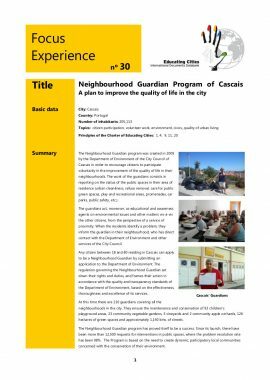 The Neighbourhood Guardian Program was created in Cascais (Portugal) in order to encourage citizens to participate voluntarily in the improvement of the quality of life in their neighbourhoods. The House of Urban Cultures of Dakar, in Senegal, was created to promote a new framework of expression and training for young people waiting to devote themselves professionally to different urban cultures, such as hip-hop, disk-jockeying, graffiti, dance, urban poetry, etc. This project was created in order to make secondary students in Brussels aware of the complexity of the Israeli-Palestinian conflict and thus build greater social harmony in the city. 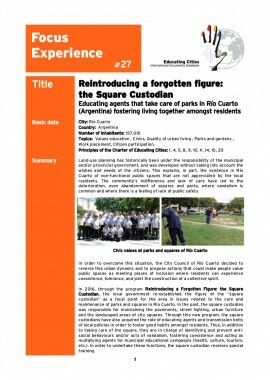 Educating agents that care and promote a better living together parks in Rio Cuarto (Argentina). The current edition of Focus Experience introduces the Makerspaces at the Espoo (Finland) City Libraries, collaborative work sites where people of different ages and interests help each other by sharing the facilities and tools, as well as knowledge, experience and ideas. An initiative of promotion of citizen participation in the conservation and improvement of environment of Braga (Portugal). 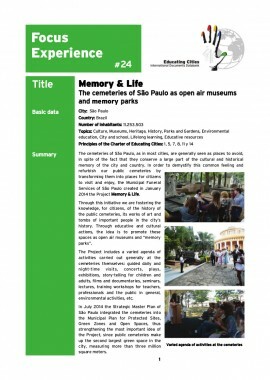 The project Memory & Life of São Paulo (Brazil) aims at making known the artistic and historic heritage of the cemeteries of the Brazilian city turning them into open-air museums and learning spaces. 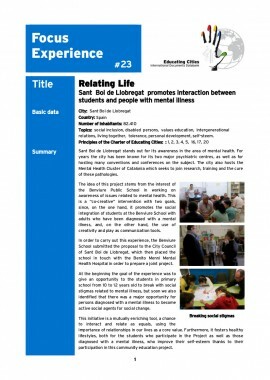 We introduce you the program Relating Life which promotes the interaction between students and people with mental illness. The current edition introduces the programme “Trust in Archimedes’ Thrust”, an inclusive facility, a meeting a lifelong learning place of the city of Settimo Torinese (Italy).